We each have emotional work in our lives, “soul work” you could call it. Along with the play involved in any creative work, my soul work finds its way into my painting; struggles caught in images. In considering a theme for the new work in my current show, the idea of home seemed to capture the pieces that were developing in my studio. The word dwell, with it’s dual meanings, was the best word I could find to use as a title and concept. As it turned out, the word led me to some places I may not have gone otherwise. As this year progresses, I find my puddle-stomping days are receding further into the distance. My 17 year-old, one-and-only son is preparing to make the leap into his own life. Naturally, new struggles and many new questions arise. How do we navigate this change? How does one let go of a person integral to a home? How does one shift from an outmoded idea of what/who makes up one’s home? What baggage do we pull along (willingly or not) from one version of home to another? What helps us on our way? How difficult is it to alter the structure of one’s emotional home and what does that entail? How do we find our new home and maintain it? The painting Major Reconstruction contemplates many of these questions. Here a home is undergoing a transformation that it may or may not survive. The effort to remake the home so that it fits the new paradigm seems overwhelming. Yet the person taking it on is getting it done. It’s not a fruitless task. It is do-able even if daunting, overwhelming, and perhaps taking a degree of persistence. This image also holds the idea of baggage: the house physically manifests the emotional baggage, or habits, we carry with us that must be constantly remolded to fit new circumstances and new needs. The image could also be taken literally as a representation of the burden of stuff we carry from place to place. 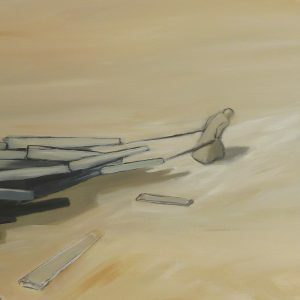 I started this group of paintings playing with the concepts of building home and leaving home as both physical and philosophical/emotional events. Building takes many forms of investment. It’s a pulling together of resources (physical and emotional) however scant, tenuous, or generous. It’s also a constant interplay and give-and-take between the people occupying the home. What changes about that dynamic when one person goes? Leaving involves an exit as well as a landing (soft or not) in a new, uncharted place. 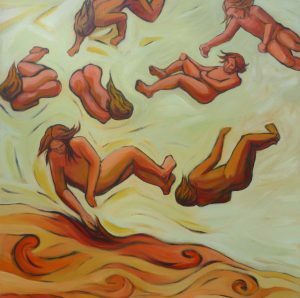 Regarding leaving, in the painting Fall, I project a wish that the toss up of people/life initiated by a major change (such as children leaving home) end with a soft landing for all involved. The falling figures in this image are radically at loose ends, obviously unanchored and heading for a fall. But even so, the figures are falling with grace and steadiness, almost stillness, to a ground that is soft, warm, and welcoming. Along the way, the theme Dwell has influenced what I see around me. These past few months I’ve been captivated by old, abandoned, and dilapidated sheds and barns in the area. Long a part of the landscape, they seem to be popping up on the roadsides and in the woods everywhere I go, suddenly freshly visible to me. 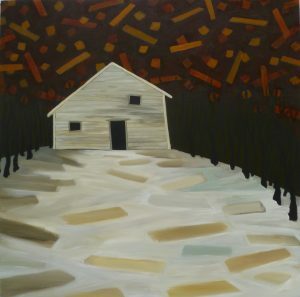 My last several paintings for this show reflect on these sightings, which resonate with the themes at hand. One of the many details of these older buildings that stood out for me was their stacked stone foundations. The painting Foundation is a riff on these, which, especially in buildings that are in disrepair, seem wildly inadequate to hold their load. And yet they do just that. I’ve taken this observation and tweaked it into a metaphor for the homes we create. The construct we call home could be seen in many ways. Home is a series of gestures, such as planting seeds like the figure in this painting is doing, that create the illusion of something solid. Home is an idea we carry inside us, like this figure is carrying his/her home (a bit of the turtle here). Home is a burden we bear on our shoulders, sometimes well and strongly, sometimes poorly or without success (either outcome could change in a flash and is tenuous by nature). Home is a fleck of dust in the universe, hence the loose boards drifting like celestial bodies above the world upon which we stand. In some cases being around these old buildings felt almost like a visitation, the buildings so eerily and wonderfully full of personality and persons. They seemed like beings in themselves, yet simultaneously, they were often very decrepit and very empty, pregnant with a feeling of our irrefutable impermanence. The painting named Cosmic Drift represents the big picture of this idea. On exhibit at the Hillsborough Gallery of Arts Through May 25, DWELL includes work by Ellie Reinhold, Ali Givens, and Nell Chandler. For more about the show, see Ellie’s additional post on the Hillsborough gallery blog. You can see more of Ellie’s work at her website. I really enjoyed reading this thoughtful essay on the emotions, growth and struggle involved in making a new body of work. I love these new paintings, Ellie. What a wonderful explanation of how life influences your beautiful paintings. Brilliant words and work. Sitting here at the end of a day, what a nice coda on a day of creative work to read such a thoughtful invitation into the reading of another artist’s work. Best of luck with your show, may it resonate with many. And yes! A terrific analysis and thought process propelling your work into the best place an art work can be! I love your work and what it means to you. The symbols feel universal. I also love the simplicity and the painterly style.